Raleigh is a great town for sports. Between all the fierce Raleigh high school rivalries and college games there is plenty for a diehard fan to enjoy on any given weekend. Nothing beats having the hometown favorite bring home a trophy. However, when the team loses a handful of rowdy fans can turn watching a good game into a violent nightmare. This brings us to the issue of dumpsters. It seems that in recent years, dumpsters have become the popular target for disgruntled sports fans that are looking to cause trouble. A few matches and a seemingly harmless dumpster becomes a flaming inferno. Now, it’s true that if you don’t live near a stadium or sports bar your chances of having a dumpster rental set on fire diminish but that doesn’t mean they still are a target. There is something about a dumpster that seems to attract all types of unwanted persons. Some of those folks are only looking for a treasure in your trash. Other Raleigh urbanites have taken to dumpster diving as a form of protest. They want to show how much food is wasted by dumpster diving and collecting all the cast offs. As unappetizing as that might sound, there is a lot of waste from restaurants and grocery stores who are compelled to throw out items as soon as they hit the expiration date. But that’s not something you’re really thinking about as your decide whether or not to rent a dumpster for a cleanup around your home. However, you should be thinking about who might be wandering by your home that might want to take a peek inside your dumpster. Sometimes the temptation is just too strong to pass up. Then there are your Raleigh neighbors to think about. If you’ve ever dumped something in a construction dumpster or any other big container then you know how easy it is to take advantage of those things. How often do you get to throw out bulk items? Of course, if you rent a dumpster is should be for your trash and not the entire neighborhood’s. 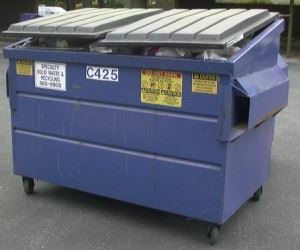 Is there an alternative to dumpster rental? Absolutely and that would be hiring Junk King Raleigh. Junk King Raleigh is a private junk hauling company that is part of a national franchise. This means that every Junk King branch is maintaining the high standards set by the parent company. You’ll be getting courteous and dependable service from workers who are licensed and insured. Instead of having a dumpster sitting around your property for several days, a Junk King crew can swoop in and remove everything want taken away in a single trip. No worry, no hassle and no sweat. That’s the Junk King way. This entry was posted in Junk King Raleigh, Raleigh Appliance Disposal, Raleigh Dumpster Rentals, Raleigh Junk Removal and tagged Raleigh Dumpster Rentals, Raleigh Junk Removal on February 27, 2013 by Britt Holcomb. Last updated August 1, 2017 .